Although Americans, as well as Alabamians, decidedly love their dogs and often consider them part of the family, pet ownership comes with the knowledge that dogs are descendants of wild animals and are ultimately capable of unpredictable behavior. Some 47 million Americans per year are bitten by dogs, half of whom are children between the ages of five and nine years old. Some 9,500 people per year are hospitalized due to the seriousness of their dog bite injuries. In addition to dog bite wounds, dog attacks can result in sprains, broken bones, lacerations, infections and many other health and medical issues. The Birmingham dog bite attorneys at Hollis Wright are well versed in the laws that dictate what determines if and to what extent a dog bite victim will be able to receive compensation for, not only physical injuries, but also emotional distress and mental anguish following a dog attack. Hollis Wright has the resources, experience and knowledge to ensure that every aspect of your dog bite case is covered, so that you receive what you deserve after being hurt by a dog. Please contact us as soon as possible after the incident if you or a family member has been hurt or killed in a dog attack. Additionally, it is of the utmost importance that you receive medical attention immediately after the dog attack. Dog attack injuries can be extremely dangerous, and your health should be your primary concern. Additionally, it is extremely helpful in pursuing these claims to have medical records of your injuries. Typically, these claims are paid by the homeowner's insurance company for the dog owner. If medical records regarding the claimed injuries don't exist, then the insurance company will impulsively conclude that your injuries are not that bad and will offer a lesser amount of money to settle your claim. WHAT SHOULD YOU KNOW ABOUT WHO IS RESPONSIBLE IF YOU ARE ATTACKED? 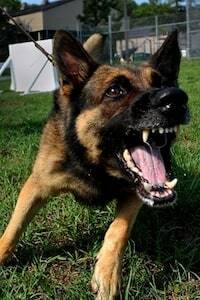 In Alabama, there are two primary forms of liability for dog attacks: statutory homeowner liability and liability on the part of the homeowner who had previous knowledge of a dog attack or bite. An injury on a dog owner's property follows Alabama's statutory law. In this scenario, it is immaterial whether the animal has or has not shown previous dangerous behavior. The animal's owner is responsible for all medical expenses incurred by the victim. Homeowners who had previous knowledge of the dog's propensity for possible aggression may also be responsible for damages, including pain and suffering, emotional distress, lost wages and permanent injury or scarring. Dog-related injury claims are responsible for more than one-third of all homeowner's insurance liability claims in dollars paid out. Under the law that holds owners responsible if their animal has previously behaved in a dangerous manner, dog owners are liable for injuries only if they did not take reasonable measures to prevent a future attack. This is often referred to as the "one bite rule," allowing an animal one bite before its dangerousness is established. However, an owner can have knowledge of the dog's dangerousness even where there has been questionable behavior and not necessarily an attack. MORE INFORMATION ON DEEMING AN ANIMAL "DANGEROUS"
Do choose a family pet with an even temperament. Do not interact with an unfamiliar dog. Do not leave small children alone with any dog. Do not try to interact with a dog that is eating or feeding puppies. Do not run away and scream if a dog becomes aggressive. Instead, move away slowly, stay calm, and do not make eye contact with the animal. If you or a loved one has been injured or killed in a dog bite incident, call the Birmingham dog bite attorneys at Hollis, Wright, Clay & Vail, P.C. You can contact us here or call 205.324.3600 or 1.844.LAW.TALK for a FREE consultation. We handle all cases on a contingency-fee basis, meaning our attorneys only get paid if they recover money for you.